In the Crossfire: will the government shut down? (CNN) - Let's start with the obvious question: Will the government shut down this week? Most likely. Republicans and Democrats can agree on that. It's everything else that has them bickering and blaming. And unless they strike a deal on a spending bill Monday, the government will begin closing shop at 12:01 a.m. Tuesday. After weeks of congressional back-and-forth, the ball is now in the Senate's court. It meets at 2 p.m. Monday to decide what to do next. A shutdown, while likely, isn't a foregone conclusion. The deadline is midnight - and one day can be a long time on Capitol Hill. Here's a quick Q&A to get you caught up on what happened over the weekend and what to look forward to Monday. 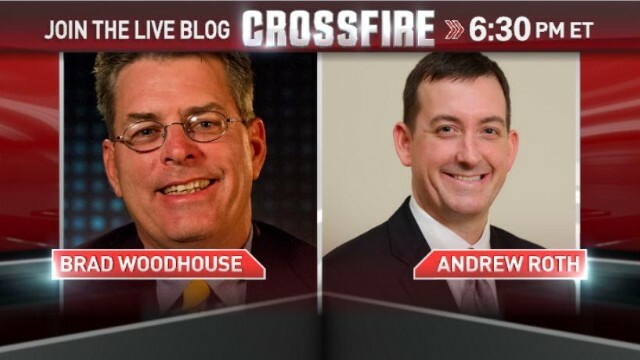 Tonight in the Crossfire: hours away from a potential government shutdown, Andrew Roth, Vice President of Government Affairs for Club for Growth, and Brad Woodhouse, President of Americans United for Change and former DNC spokesman, join hosts Newt Gingrich and Van Jones. We want you to weigh in. Do you think the government will shut down? Vote by responding below, replying to our tweet, or by commenting on our Facebook post. We the People in Order to form a more Perfect Union... are letting 30 or 40 Congress-people destroy American credibility... As bad as it is this fragile system is all we have, and one of the better systems of gov on the planet, no? We the People together may indeed need to fix the way gov works to form a more perfect union, but not before we understand how 30-40 members of Congress can utterly up-end our gov functions and disregard the voice of all the rest of the People. Former Secretary of Treasury and State James Baker said today on CNN that Republicans need to win elections before they can win change...that's how the system works, better or worse. Something not all of We the People seem to get. Newt Gringrich keeps harping on about the President is not talking to Congress. He cites this as the reason for the budget crisis. In short, the negotiations are done within the respective chamber. It would be logistically impossible for the President to negotiate with all 535 members. Congress would not be able to function. I just finished watching crossfire. I am a Democrat but I totally agree with Gingrich when he says the top people to talk and get to know each other. This is just ridiculous and down right hateful all because OBAMA is President. I haven't seen this type ignoring of a LAW since desegregation was ordered to end. It's the law it passed and the Majority of American people agree! Come on guys, let's call Obamacare for what it is, it's an entitlement. With all the talk about the gov't. wanting to cut back on entitlements we sure as hell don't need another one. What is the gov't going to do, cut back on social security benefits and medicare benefits to help pay for Obamacare? With the subsidy amounts I have been hearing to help people buy insurance, I don't think we can pay for it without a huge tax increase. By the way, quit calling social security and medicare an entitlement, the working public paid into it their entire working carrers. There wouldn't be a problem with social security if Congress had kept their grubby hands on the people's money.